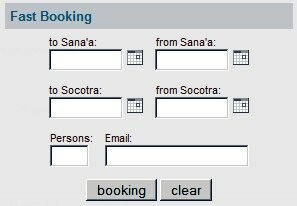 From now you can book your trip to Socotra and contact our managers who are responsible for your stay in Sanaa and Socotra through our booking system. To do that, just enter our site using your login/password or fill a fast booking form on the main page. Afterwards, you will be able to enter and edit your data, as well as to do your correspondence with our managers. Each of them will know the whole history of your correspondence regarding your booking. 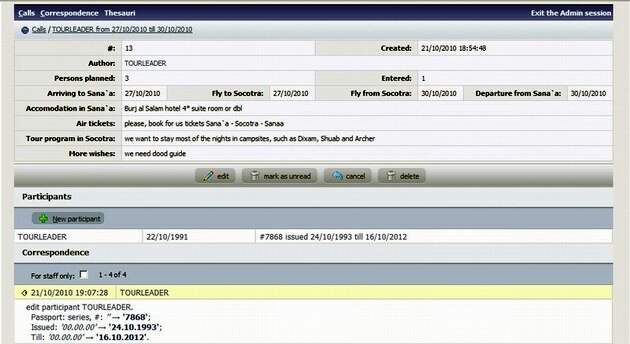 We plan to modernize the system to allow you to construct your tour to Yemen and Socotra on your own. The system works in a test mode and is constantly updated. If you have any problems, please, do not hesitate to contact us by e-mail.